Ok, good, now we’ll want to do a search in the Google field. Let’s give “insurance” a try. Now I’m hoping that you are savvy in your discovery here as what I’m seeing is, everything that uses the words “insurance” used in the header or body for articles is being listed below under recent articles. This of course is per “most recent”, which to me suggests that you can easily get seen if you do alot of posts on your own niche (genre, market, territory…etc.) Now this post list will get busier as the days go by and more content is generated, though in the meantime your article or post might stay around just long enough to form a lead or get followed. 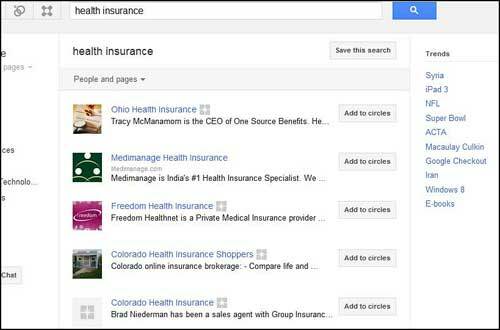 Knowing this, it also suggests that Google+ will sort recent articles based on what is searched for whether simple like “insurance” or more complex like “medical health insurance”. This will still work whether you have signed up or not. 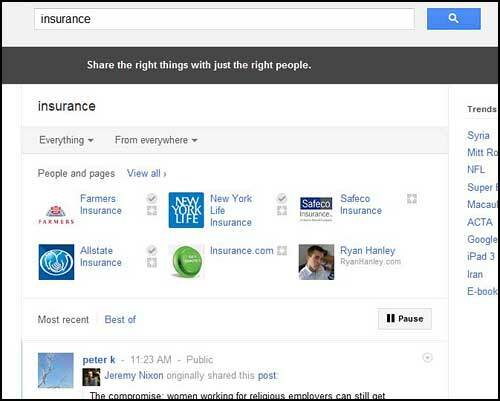 So the point here at the end of the day is, if you are an insurance software company or trying to get your business name out, then you can gain some instant visibility in your market thru the Google+ search engine. As your circles increase (as you are followed) your posts will gain relevance to the searchers who follow you….. The new internet model has indeed arrived, my friends. Remember…while you’re thinking about it, others are already moving forward. The new Marketing space is Inbound Marketing. Read up, get connected, and start connecting to those who are looking to solve their problems. Like the article? Then show your appreciation by following Simple Inbound so that you are notified of more.